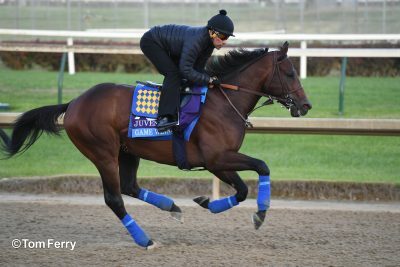 Alwaysmining: 4/13 – The multiple stakes winner, who has reeled off five straight victories, had his final work in advance of Laurel Park’s April 20 Federico Tesio Stakes, a four-furlong breeze on the fast all weather course at the Fair Hill Training Center in :49.00 (3/21). Bodexpress: 4/11 – The Grade 1 Florida Derby runner-up, who is currently 21st on the leaderboard to run for the roses, breezed five furlongs in 1:01.20 (1/5) over the fast main track at Gulfstream Park West. Code of Honor: 4/12 – William S. Farish’s homebred beat a heavy rain with a 6:15 a.m. four-furlong breeze on Keeneland’s fast oval in :49.00 (9/27). Cutting Humor: 4/12 – Trainer Todd Pletcher’s Grade 3 Sunland Derby champ began preparations for the Grade 1 Kentucky Derby by breezing four furlongs in :47.90 (1/15) over fast dirt at Palm Beach Downs. 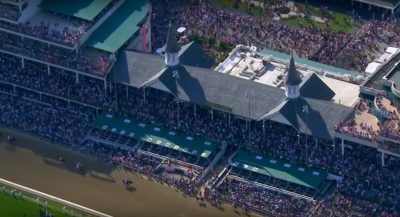 Market King: 4/14 – Conditioner D. Wayne Lukas’ charge breezed four furlongs on a sloppy surface at Churchill Downs in :52.20 (3/3). Maximum Security: 4/13 – The unbeaten Grade 1 Florida Derby winner crawled four furlongs in :54.85 (50/50) over a fast track at the Palm Meadows Training Center.